Since we were little my mom gave us new pajamas or nightgowns to wear on Christmas Eve. It wasn’t something that we did every single year. When we were in high school mom started getting us Christmas jammies every Christmas Eve. In 2000 I had been working in a lingerie department for a few years and decided that I should take over the jammie buying. I had very specific pajama needs at the time, so I wanted to make sure to get it just right 😉 That same year my aunt, uncle, and cousins moved back home to Beaver Falls from Lancaster, PA, so I decided to buy matching jammies for my sister and I and also my cousin. The tradition was born. Every year since then I’ve been buying matching Christmas themed pajamas for my sister, cousin, and myself. 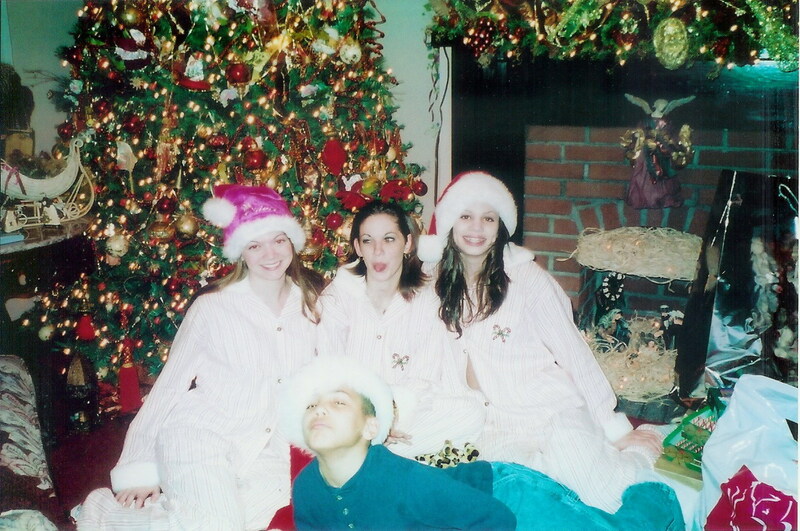 During the 10 Days of Christmas Pjs I will showcase our Christmas jammies from the last 10 years 2001 to 2010. These are probably my favorite Christmas jammies of all. You can’t see it too well in the photos, but these pjs have red candy cane stripes on them, Santa fur collar and cuffs, and jingle bells for buttons. Yep…awesome, I know! Next to me in the photo is my sister, Jess, and my cousin Aunia (14 at the time), and my cousin Ben is in the front (9yo). Wait until you watch these kids grow up in these photos over the decade! Posted on December 15, 2010, in Christmas, Christmas PJs, Flashbacks, Holidays, Traditions and tagged Christmas, flashbacks, Holidays, pajamas, photos, tradition. Bookmark the permalink. 1 Comment. Great idea! I need to dig out all my photos of chirstmas morning:) Happy SITS day a few days late!